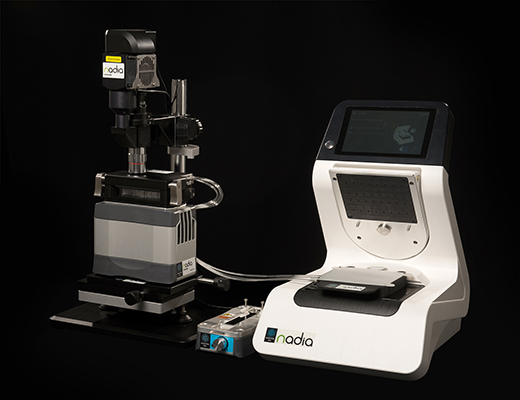 The Nadia instrument is a touchscreen-controlled, droplet-based microfluidic platform for single cell research, combining superior microfluidics, automated temperature control and gentle cell/bead agitation to offer a single compact instrument that delivers highly precise and reliable results. One, two, four or eight samples can be run in parallel, generating up to 6,000 high quality, single cell libraries per sample in approximately 15 minutes. Configuration with the Nadia Innovate protocol development platform transforms the system into a scalable, open system for the creation of new procedures and applications. Users can alter parameters – such as droplet size and frequency, temperature, agitation and timings – and optimize protocols with the aid of real-time visualization, enabling straightforward development of new single cell protocols and applications.